There’s a reason why Branson, Mo., is one of the most popular vacation destinations in the country. With hundreds of live shows, a long list of outdoor attractions and some of the most beautiful scenery in the U.S., it’s easy to see why it’s the entertainment capital of the Midwest. When you think of Branson, odds are that the first thing that comes to your mind is the live entertainment. And for good reason! The century-old city is the proud to be the site of hundreds of music, comedy, theater and variety shows from bluegrass to magic to Waltzing Waters. But with all of the popularity surrounding Branson’s showbiz, it can be easy to miss the broad range of attractions outside of the theaters—ones that are perfect for all ages! Let’s start with the kids. As one of the most family-friendly cities in the country, Branson provides hours of entertainment for what can be the toughest audience to please. But even those with shortest attention spans are sure to enjoy a ride on the Ducks or an afternoon at Silver Dollar City. There’s also the famous White Water outdoor water park that offers fast-paced rides and 7,000 feet of slides. And, if that’s not enough, families can take a trip to The Track Family Fun Park where go-karts are the name of the game. From dare-devils to safe drivers, there is a track for any youngster who dreams of putting the pedal to the metal. Because Branson is so family-friendly, its romantic charm tends to go unnoticed, so, when it comes to adults, Branson can be one of the most surprising getaways. Not only does it offer plenty of shopping and fine dining, it also hosts a variety of options designed to help couples escape from it all. With three beautiful lakes and the tranquil nature of the Ozarks, Branson is a haven for many couples looking for a quiet retreat. Check out the local wineries, golf courses, spas and more to create the perfect getaway. There are even options available for horseback riding, hiking, fishing and scuba diving. It all depends on you and your idea of R&R. Finally, with all of its charm and hospitality, Branson is also an ideal destination for those enjoying their golden years. 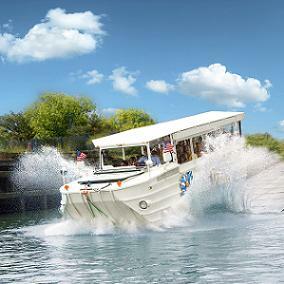 One of the most popular attractions for seniors is the two-hour lake cruise aboard the Showboat Branson Belle. Guests are treated to fabulous food, live entertainment and the beautiful panoramic views of Table Rock Lake. For those not interested in time on the water, there’s also the Branson Scenic Railway—a vintage passenger train that takes guests on a trip through some of the most scenic Ozark countryside. But don’t discount Silver Dollar City, which is highly entertaining for the older generation as well. With hundreds of shops, a wide variety of dining experiences and daily demonstrations from craftsmen, the park is just as fun for seniors as it is for children. Clearly, Branson is an ideal vacation spot for all ages—6 to 60! And now that you know a few entertainment options, all you need is a place to say. At Stay in Branson, we offer vacation rentals for that combine quiet, resort-style living with easy access to the city. You’ll be able to enjoy your own space, resort amenities—including a pool and golf course—and all the entertainment Branson has to offer. So, don’t wait for the summer to pass you by. Whether you’re a newlywed, a family of five or a retired couple looking on a road trip, contact us today and come see what Branson has to offer!